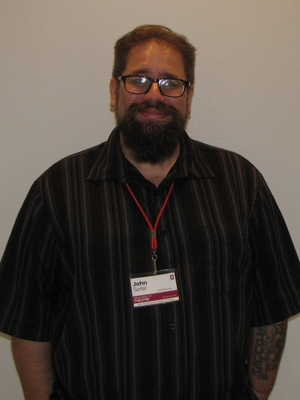 John Michael is a Fellow in the PhD program, pursuing an additional Graduate Interdisciplinary Specialization in Disability Studies. Immediately before coming to The Ohio State University, John Michael was serving as the head of theatre programming at Cowley College in Kansas, where he created two new scholarships, developed three new degree tracts, three new courses, and directed an average of four productions per year. Previously, he taught Commedia dell’Arte, Absurdism, Puppetry, and other special topic theatre courses at Chester College of New England, and served as a Graduate Instructor of Theatre at Baylor University where he was nominated twice for the university’s “Outstanding Graduate Instructor” Award. Other previous credits include casting for film (including the Sundance Selection Mystery Team), playwriting (including productions at Boston Playwright's Theatre and NYC’s Shelter Theatre), Dramaturgy (including The Ohio State University’s 2016 production of One Man, Two Guvnors), and over 75 directing credits, including at the New England Fringe, Provincetown Fringe, and Central Texas Opera Festival. He serves as Co-Editor with Dr. DeAnna Toten Beard of Texas Theatre Journal, and has edited books and published articles and/or creative works with McFarland Publishing, Ghostlight Publications, Hippocampus Press, and others. He is a voting member of ATHE's Excellence in Editing Awards Committee and has served as a Respondent for Regions I and V of the Kennedy Center American College Theatre Festival. He holds an MFA in Directing from Baylor University, a BA in Dramatic Literature and Theory from Granite Stage College, and an AA from Northern Essex Community College. His current research interests include disability portrayal, re-thinking theatre’s artistic and commercial approaches to accessibility, and Yiddish Theatre in the United States. John is the 2018 recipient of the Norbert and Gretel B. Bloch Scholarship.